We can set up an automated system for your practice that is SIMPLE to implement and will help you identify the patients who are the most engaged and enthusiastic about your services. They are the ones who are much more likely to give testimonials, referrals and spend money on private pay services. Once identified, they are plugged into an appropriate follow-up marketing program. The less enthusiastic patients are handled differently. This system also helps patients (and you) maximize the benefits of their insurance plan. How many times have you lost optical revenue to a big box retailer because the patient simply didn't understand how their insurance plan worked? Education is the key, both before and after a patient visits your office. The ROI (Return On Investment) with automated systems is significant! AND WE DO ALL THE HEAVY LIFTING TO IMPLEMENT THEM! Once in place, there is minimal staff time involved in running them. The systems are easily modifiable as your needs change. 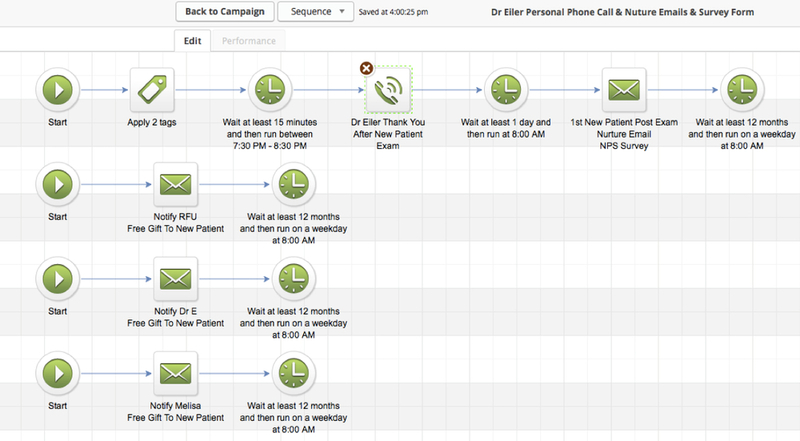 Patients receive only the messages that are appropriate to their needs and interests - AUTOMATICALLY! You get a link to simple webpage where your staff will enter the name, email and phone # of the patients you see each day. Your patients receive an automated phone call from the doctor that saw them (in the evening after their exam) that thanks them for their patronage and tells them about the free gift (new patients) that they will be receiving. If this call goes to the patient's voice mail, a different message is played that sounds as though the doctor is calling them personally! A staff member will receive an email reminding them to send a free gift to each new patient. Based on the response they give on the NPS Survey, they will automatically get the appropriate follow-up which may or may not include product education, referral requests, testimonial requests, promotions, newsletters, reminders, etc. You get a report of your survey results along with testimonials, referrals and responses to special promotions or offers. You tie staff bonuses and perks to the NPS score which provides high motivation to provide each patient with a superior experience. If you are satisfied with the results, we will continue administrating this system for you for a monthly fee, or teach you how to do it yourself. You can add additional functionality to the system by incorporating automatic follow-up on optical/contact lens purchases, items checked on your intake form (CRT, Sports Vision, nutrition, supplements, dry eye, lid cosmetic procedures, blepharitis, allergy, vision training, etc.). If you would like to schedule a FREE consultation on how this might look in your practice, CLICK HERE.